It is always a refreshment to hear from you and I am very grateful to you for your letter of the ninth. I am very glad you have been “paying your respects” to the People's Council. It is for the most part a bad and mischievous lot. 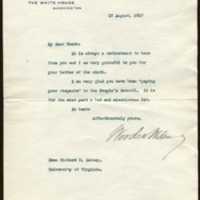 Wilson, Woodrow, 1856-1924, “Woodrow Wilson to Richard Heath Dabney,” 1917 August 13, WWP20525, University of Virginia Woodrow Wilson Letters, Woodrow Wilson Presidential Library & Museum, Staunton, Virginia.